Diva Pyari of Linea Carta was one of the first ‘modern calligraphers’ that I knew of that sold a kit, which I of course promptly purchased. I found it almost too gorgeous to use, the exemplar a little work of art. It was one of the first times I was introduced to tools that actually helped me gain some confidence in my burgeoning skill set and helped me to continue to pursue my love of lettering, for that I am grateful. We are thrilled to be able to add Diva’s interview to our long list of talented lettering artist interviews. Without further ado…. I’ve been a lettering fan since I can remember! My 2nd grade teacher Ms. McIntosh had beautiful script, I completely idolized her. When I was 10, my grandma gave me this little leather coin purse and sewing kit, and wrote my name on it in cursive. I had no interest in the kit but was SO EXCITED because it had my name in her beautiful script. I also remember how in 6th grade I befriended the girl who sat in front of me, Camille Farnsworth, solely because she had her own amazing style of penmanship — think Japanese: perfect and exact print — but then also with her own quirks here and there. I tried out every art-store calligraphy kit, played with illustrative lettering, was always on the hunt for ‘a good black pen’, savoring the Blank White Sheet of paper. 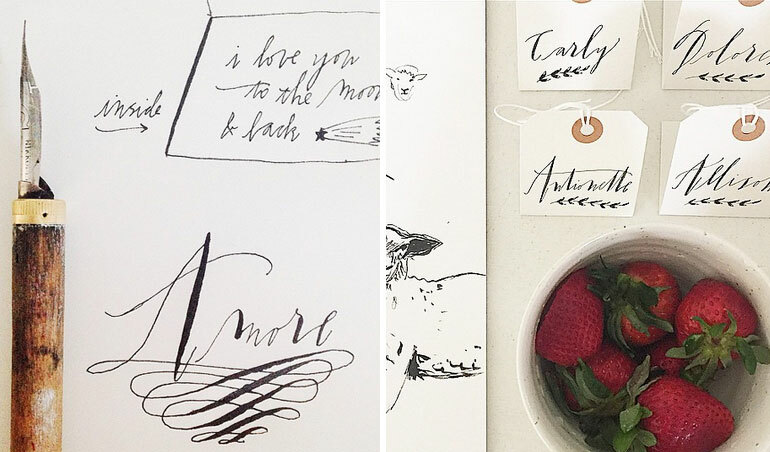 As for developing my own calligraphy style, I was most inspired by Lauren McIntosh from the charming little shop, Tail of the Yak, in Berkeley, California. About 6 years ago I walked in the shop and there were all these lovely little signs in her graceful hand, ‘Soap $1’ — it was nothing like I’d ever seen, full of personality. I went right up to the shopkeeper and asked who did that and do they teach classes?! Later that year I was at her home copying her delightful calligraphy, and after a few months of obsessive practice one of my fellow students asked if she could hire me to do the calligraphy for her wedding invitations and address her wedding envelopes. That job led to others, and years later here I am! The Nikko G is my go-to nib, and I use Noodler’s Bulletproof American Eel Ink (waterproof and archival black) for many of my professional projects. I also love McCaffrey’s Oak Gall ink, though a more transparent ink. I use gouache quite a bit, Windsor & Newton Designers Gouache, to mix custom colors. These days for projects I work mostly on Bond Layout Marker Paper – it’s smooth but picks up very subtle details. For brush lettering I like the Utrecht Sablette size 0, and my favorite pen right now is by Muji (0.38mm hexagonal gel-ink needle tip). I sell my Calligraphy Starter Kit, Workbook, and A-Z Chart online – and even better if you can make it to one of my workshops for hands-on guidance! I also teach an intermediate workshop, and my Workbook No. 2 will be available soon! You can find more of Diva’s work here, here and here.